Recently, I was shocked to find out that Hawaii was just ranked the riskiest state in the nation for pedestrians age 65 and older. The National Complete Streets Coalition found that 42.2 percent of pedestrian deaths in Hawaii from 2005 to 2014 were seniors. Now, that’s a distinction we’re definitely NOT proud of! But, the news got me thinking about ALL pedestrians in Hawaii, especially visitors who aren’t familiar with heavy traffic areas and dangerous intersections. With so many visitors in crowded areas like Waikiki, how can we help keep you safe when crossing our roads? What do you need to know to stay safe while walking in Hawaii? 1. Cross the street only at the corner or at a crosswalk. While crossing, keep to the right of the crosswalk. 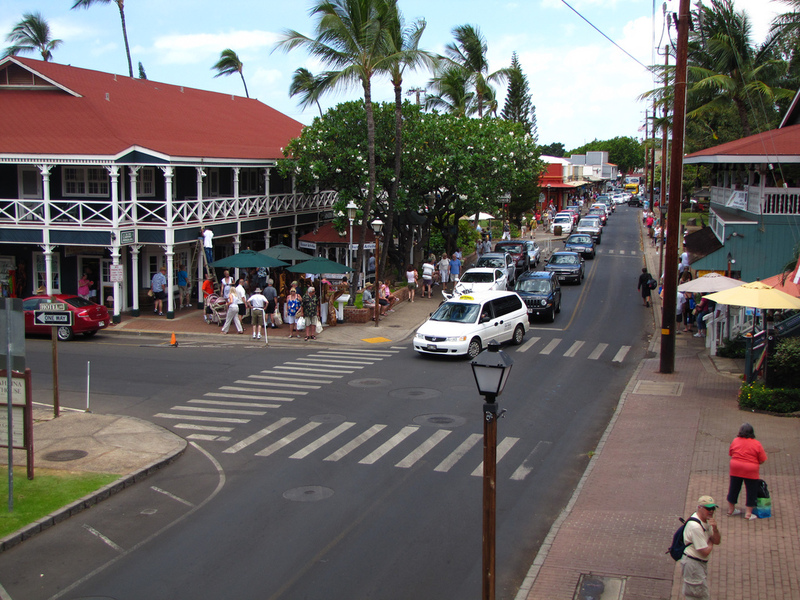 Even the quaint city streets of Lahaina can proved to be dangerous when busy pedestrian and auto traffic converge. 2. When crossing at a lighted intersection be sure to use the pedestrian signal button and wait for the walk light indicator. 3. Be sure to look left-right-left before crossing and continue to look while crossing. 4. Always walk across the street, never run. 5. Walk on the sidewalk if there is one; if there is no sidewalk, walk on the left side of the roadway facing traffic. 6. Wear bright or light colored clothing when out walking or jogging. Wear retro-reflective materials at night. 7. Watch for cars backing out of driveways; drivers don’t always see you. 8. Stand on the side of the road while waiting for the bus. Always stand at least 10 feet away from where the bus will stop. Although not listed, it’s equally important that visitors make eye contact with drivers who are expected to stop to let you cross. In Waikiki especially, it’s important to make sure the driver sees you before you cross, even if you’re in a designated crosswalk. And, keep in mind that texting and walking can be dangerous, too. If you’re looking down, not only is it impossible to make eye contact with drivers, but you may also inadvertently miss a signal prompting you to wait. For visitors heading to a Waikiki beach activity, such as surf lessons, it’s extra important to cross carefully — Waikiki is one of the busiest areas of town, for both pedestrians and drivers. Hawaii ranks amongst the most dangerous states in the US for pedestrians. Not surprisingly, some of Hawaii’s most dangerous intersections are near heavy visitor venues. In fact, in 2015, when the law firm Davis Levin Livingston released its 2015 Honolulu accident map, which plots all 40,000-plus crashes and accidents that occurred in 2014, they reported that, by far, the worst area in 2015 was around 1450 block of Ala Moana Blvd with 312 accidents. 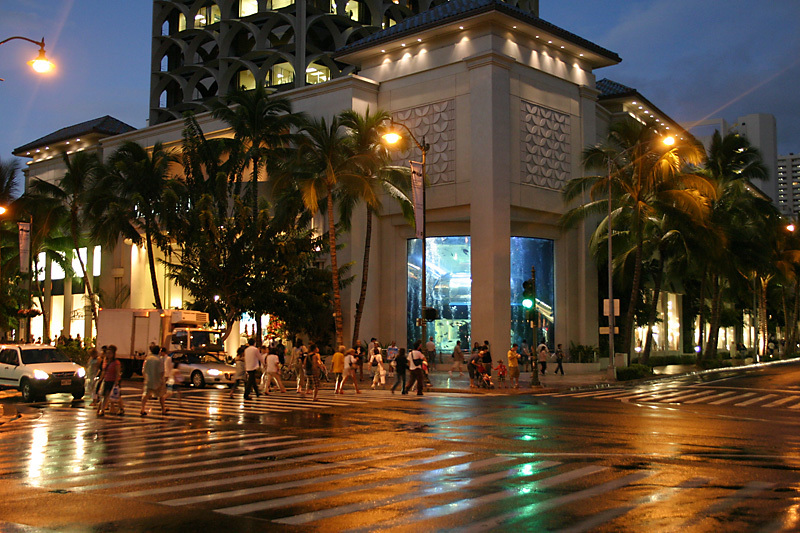 This area includes the whole Ala Moana Center and surrounding parking lots. Other areas included Waialae Avenue, N. School Street, and, not surprisingly, several locations along the H-1 Freeway. The vast majority of visitors are safe when walking in Hawaii, but older pedestrians or those distracted by cell phones are at higher risk. So, take your own pedestrian safety seriously, and walk wisely!